Although there are a number of functions here, this is a single plate belonging to a more complicated instrument. Evidence for a hinge and catch, and for the former existence of a folding extension to the index arm of the nocturnal, show that this was once part of an astronomical compendium. 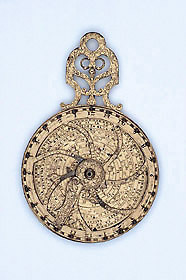 Even in its present reduced state, this instrument tells the time at night, the time by day in four latitudes, and for a single location gives the times of sunrise and sunset and the lengths of day and night throughout the year.